Do you find yourself listening to your self-deprecating voice and avoiding new opportunities? You are not the only one to be frozen in place, a victim of the Impostor Syndrome. In fact, not long ago I found myself in a similar situation. Watch my video below to learn how I managed to quiet my self-deprecating voice so that I could take on an exciting new speaking opportunity. In an article on Tiny Buddha, the author offered some great advice about that negative, self-deprecating voice. “Most of the thoughts that roam around our heads are completely inane and useless! Your thoughts do not make you a bad person, because guess what? Your thoughts aren’t real. They are just fleeting ideas that you can control if you take the time to learn how. It’s pretty obvious, but the way you handle your thoughts will massively impact your life. Those of us who get caught up with spiraling negative thoughts when things don’t go our way will find it hard to progress in life and get stuff done, as we’ll be dealing with things like fear and anxiety. In an article from The Journal of Behavioral Science Magazine about the impostor phenomenon, the author states, “As one review article by Jaruwan Sakulku and James Alexander explains, something like 70 percent of people ‘will experience at least one episode’ of IP in their lives, and it’s been found in a wide variety of professional and academic settings.” So, you are not alone. Most everyone in your office has felt the same way you do. To determine if you are in fact suffering from Impostor Syndrome, click on this link to take a quick 9 question quiz: Do You Suffer from Impostor Syndrome? In the meantime, if you focus on the areas of business in which you have the most impact and influence, your success and experience will inherently quiet that self-deprecating voice that has been holding you back. In my first book, The Working Woman’s GPS, I talk more about the I/I quotient (impact/influence), how you determine what yours is and then how to begin to develop a plan to use that information to help advance your career. 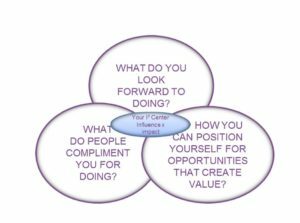 You can learn more about this in this blog post I wrote, but to go over it briefly, the I/I is the sweet spot where what you look forward to doing, what people compliment you on and what opportunities are available, come together. Here’s my advice to you: Focus on what you know and enjoy doing and your Impostor Syndrome will become a thing of the past.